This year marks the 30th anniversary of the Temecula Valley Balloon and Wine Festival, and organizers are mixing things up a bit by including several of the valley’s breweries in the festivities. Aftershock Brewing, Black Market Brewing Co., Brew-Ligion, Ironfire Brewing Company, Refuge Brewery and Wiens Brewing will be sampling and pouring at this year’s event. The festival continues from 6 a.m. to 10 p.m. tomorrow (June 1) and 6 a.m. to 5 p.m. Sunday (June 2) at Lake Skinner Recreation Area, 37701 Warren Road, Winchester. I’ve never understood why Southern California residents dash out of town en masse on long holiday weekends negotiating huge traffic jams to spend their days in packed campgrounds or resort hotels cheek to jowl with other Angelenos. I’ve never understood it, but appreciate it because that means some usually packed restaurants and pubs in Southern California (Torrance’s new Rock & Brews has experienced diners willing to wait up to an hour for a table since it opened, according to anecdotal reports I’ve been getting!) are relatively crowd-free for the weekend. And with the booming craft beer industry locally, there’s even less reason to head out of town when you could be enjoying an unhurried quality brew or two at home as summer unofficially begins. Downtown’s Angel City Brewery, which officially opened earlier this month, is hosting a Memorial Day barbecue. The event, which runs from 1 p.m. to 10 p.m. includes free sliders and dogs from 1 p.m. to 3 p.m. (or until supplies run out). Angel City has about a dozen brews on tap in their cool historic building in the Arts District including the brand new Pen is Mightier. Torrance’s Smog City Brewing, which also officially opened last weekend, will serve a “decadent” Double Chocolate Imperial Stout cellared since last November that has “only gotten better,” according to co-owner Laurie Porter. 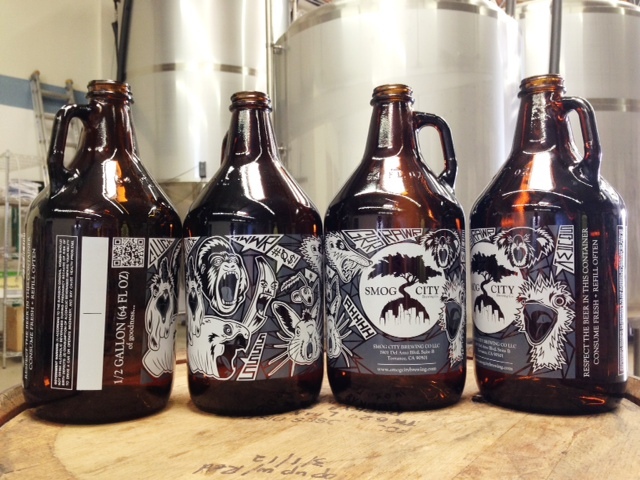 Their cool growlers (pictured above) have arrived, too, so you can take home their Smog City XPA for Memorial Day. Incidentally, Torrance Mayor Frank Scotto is scheduled to participate in an official ribbon-cutting at the brewery at 4:30 p.m. June 7. Taste of Brews returns to downtown Riverside Saturday with an impressive lineup of breweries and food trucks. More here. The Federal Bar, a gastropub in the former Madison Steakhouse space, has opened in downtown Long Beach. What did I miss? Feel free to add other craft beer-oriented events in the comment section. Lake Elsinore’s Craft Brewing Co. is celebrating turning three next month and has invited a baker’s dozen of other Inland Empire brewers to the party (and one from a little further south). Beer lovers, we’ve found the perfect way to kick off your Memorial Day weekend. The Taste of Brews returns to Riverside’s White Park (3901 Market St.) on Saturday, May 25. Not only can attendees sample from dozens of breweries, including many from Southern California, but there will be several food trucks and local restaurants providing comestibles, and three bands to enjoy. Total Wine and More has been hosting a series of beer tastings this week (May 13 to 19) to celebrate American Craft Beer Week. Each store is offering different breweries’ beers (including several Southern California breweries) to sample for a nominal fee. Head over the jump for the schedule. Here’s a fundraiser we’ll eagerly raise a glass to: Select-A-Brew at Citizens Business Bank Arena. The folks at the Ontario Reign have transformed the annual Select-A-Seat season seat holder selection event into a fundraiser for the team’s charitable arm, the Hope Reigns Foundation. 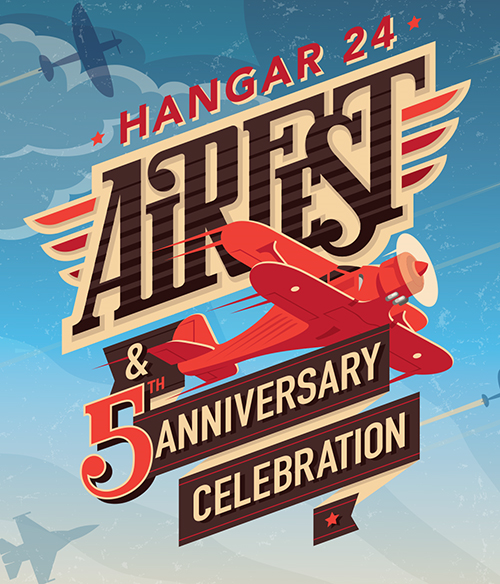 Tickets are available now for Hangar 24 Craft Brewery’s AirFest and fifth anniversary set for Saturday, May 18. Tickets are $5 at the brewery’s tasting room, 1710 Sessums Drive, Redlands, or online (plus $1.17 service fee) and will be $8 at the door. Kids 12 and younger will be admitted free. 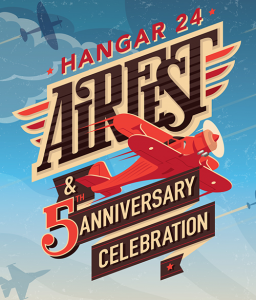 A limited number of VIP ticket packages, which include all-you-can-drink Hangar 24 beer, all-you-can-eat Cuca’s, the closest parking possible, a shady tent and the best seats and views of the air show, are available for $150 (plus $6.24 service fee), or $500 (plus $18.49 service fee) for a four-pack. 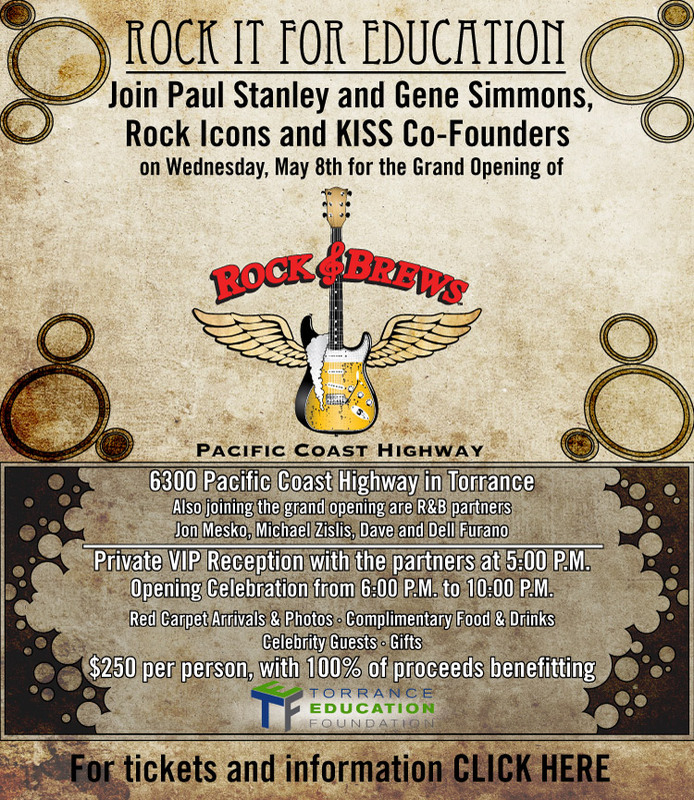 Rock & Brews investors and co-owners Gene Simmons and Paul Stanley, two of the founding members of Kiss, will rock it for the Torrance Education Foundation Wednesday, the day before their newest restaurant location opens in Torrance. 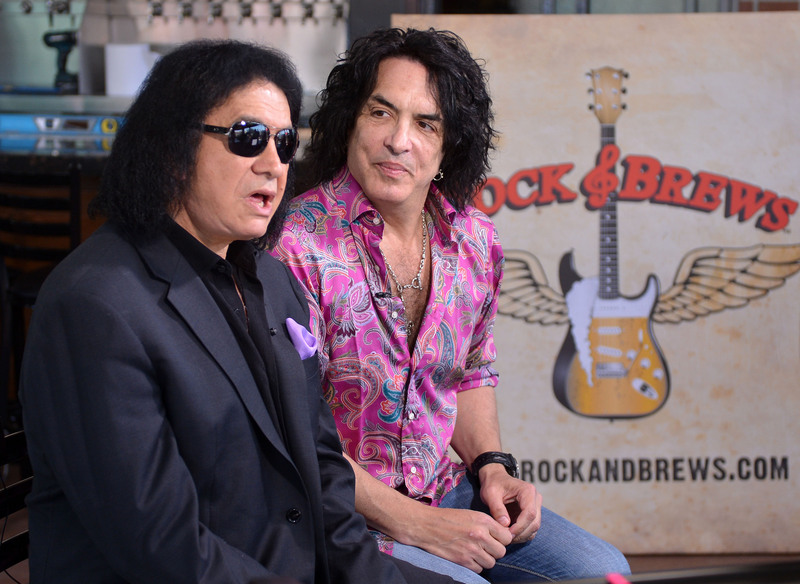 We’ll have more on Rock & Brews in the Daily Breeze Sunday. Read the story here.